Is the Way These People Are ‘Hunting’ Feral Hogs in This Video Inhumane? Gun rights group Open Carry Tarrant County is threatening to return to court after Arlington, Texas, proposed a new set of rules to prevent them from handing out literature at city intersections. The group won the first round of a federal lawsuit in July against the city to prevent enforcement of a local ordinance against pedestrians handing out material along designated roadways to motorists that are not in parked cars. The activists believed the law would ban their long-held practice of handing out literature and other materials, including copies of the U.S. Constitution, in the city. The Fort Worth Star-Telegram reported that Arlington is poised to approve further amendments to the sidewalk ordinance that would ban interactions between pedestrians and motorists at intersections in the city that are controlled by a traffic signal. Fugate explained that the city is trying to walk a narrow line between public safety and preserving First Amendment rights to free speech, which was the basis of OCTC’s successful lawsuit that struck down Arlington’s previous sidewalk limits. The city argues that it has real cause for concern with 64 crashes involving pedestrians in Arlington documented in the first seven months of the year. The new proposal is based on one in nearby League City which satisfied the Fifth Circuit Court of Appeals in a similar case. In that 2007 suit, the city was brought to court by a group of newspapers after street vendors were forced from city intersections by a local ordinance. Once League City repealed its ordinance everywhere but at cross streets controlled by traffic lights, the court vacated the suit in part. However, OCTC takes issue with the pending Arlington measure and its $500 fine for handing out anything from an intersection or median, which has exceptions made for firefighter and police groups. 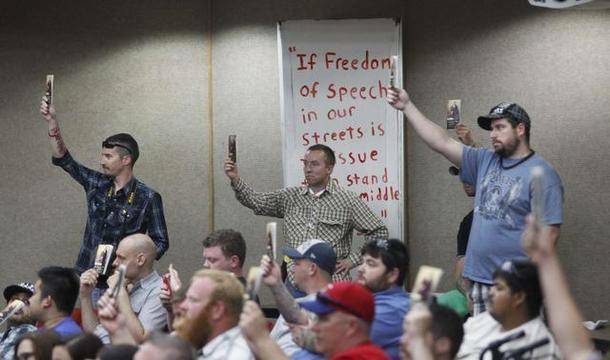 As such, the open carry group is prepared to once again take the city to court to protect perceived threats to its First Amendment rights. The Arlington City Council is scheduled to vote on the new ordinance at its Oct. 28 meeting.